TheAngrySpark: Conan vs Groo. Yes really. Dark Horse comics announced today that one of the most unlikely team-ups of all time is actually happening. What was rumored as an April Fools’ joke has turned into a full-blown miniseries sure to bring laughs and excitement. 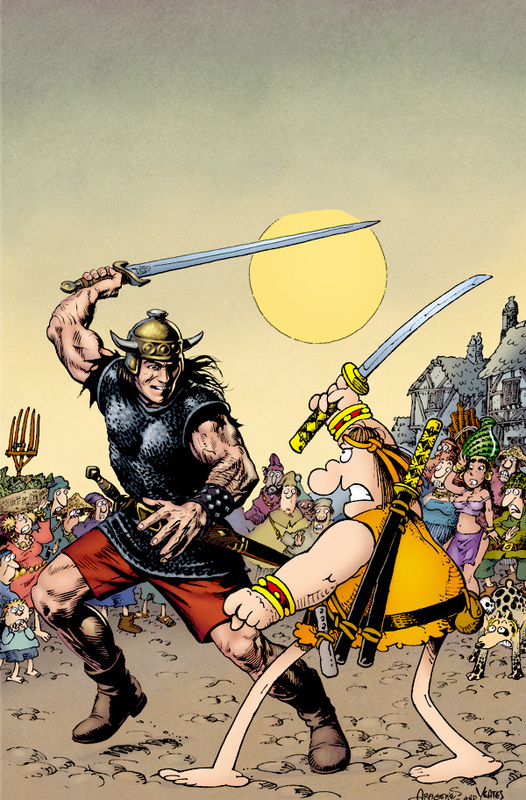 Dark Horse Comics is proud to announce Groo vs. Conan! It had to happen: The most heroic warrior in history meets the stupidest, as Robert E. Howard’s immortal Conan the Barbarian crosses swords with Sergio Aragonés’s Groo the Wanderer in Groo vs. Conan #1! This four-issue miniseries was concocted by the Eisner Award–winning team of Mark Evanier and Sergio Aragonés, aided by master illustrator Thomas Yeates and master colorist Tom Luth. Will Conan annihilate Groo? Will Groo turn out to be the man who can defeat Conan? We’ll see. I... I just don't know what to say about this one. As a big Conan fan, I'm definitely going to be picking this up just to see where it goes. But, how the... I mean what... uh... oh forget it.